Sometimes, there are albums that genuinely make me excited that I get to review them. 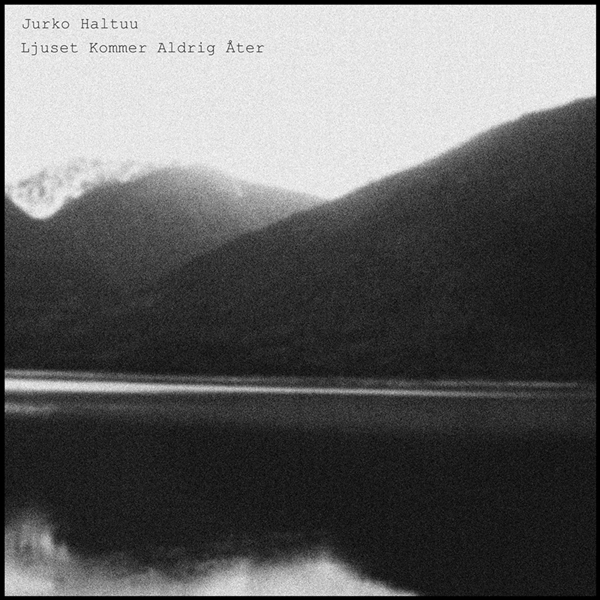 Reviews for noise can often feel like they can be written via template, filling in the requisite titles and artist names and then describing the sound as “more of the same.” While Jurko Haltuu has crafted a long piece of drone music with Ljuset Kommer Aldrig Åter (The Light Will Never Return) – which doesn’t necessarily scream fresh or original – the 45-minute track on offer here is fluid, hypnotic, and quite atmospheric to the point where it feels easy to stick it on loop and repeat it for the mood. Much like noise walls can be cathartically stationary, Jurko Haltuu uses one two-minute loop of a field recording to layer the initial sound with a long-winded, flowing drone of dense proportions. It starts out low, slowly amping up the volume until it reaches a climactic texture. From here, the 45 minute track coalesces quickly, expanding with reverb and ringing until it seems saturated, then backing off again. It does this endlessly, over and over, to differing results, but each time it feels different. The mood is palpable, and despite the length of the release, it’s easy to slide in and out of the track, consistently altering your mood to a very dark gloom. You can hear the field recording sound of Ljuset Kommer Aldrig Åter, like the buzz and hum of the highway making its way into the drone at opportune moments. That recording of movement, the sense of the whir of cars as they whiz past with speed, is embodied within Haltuu’s noise, even when it goes nowhere. It’s a great piece of drone, stationary and mobile in a hypocritical sense.